Violating its dictates can ruin a life. Anyone harboring doubts about the left-leaning media living in a bubble should examine the views of Helen Rosner, a graduate of Smith College who writes about food for The New Yorker. 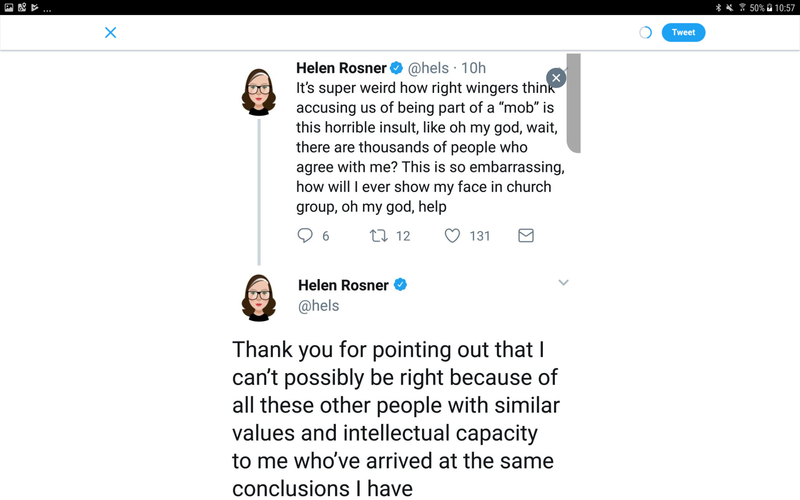 She recently went on Twitter to announce that “it's super weird that right wingers think that accusing us of being a mob is this horrible insult.” In her next tweet, Rosner referred to the “thousands” of people with “similar... intellectual capacity” who agree with her political views. It’d be a challenge to find two back-to-back statements more indicative of the flaws in current left-wing thinking. How is it possible that someone writing for an elite NYC publication cannot see the mob—any mob—for the pernicious phenomenon that it is? Here's a dictionary definition: “a large crowd of people, especially one that is disorderly and intent on causing trouble or violence.” There’s little room for doubt about what a mob’s all about. It's an indication of the modern Left’s cult-like nature that Rosner, doesn’t mind being called a mob member. The remark about intellectual capacity is also an indication of the clear edge in brainpower they’re certain they enjoy over all of their political opponents, a belief that's particularly manifest among the cocooned, New York City media insiders like Rosner who routinely dismiss right-wing views as if they're not even worthy of devoting one neuron to. The false confidence of the Left is now so pronounced that even its inability to defeat the weakest presidential candidate the Republicans have ever nominated hasn’t given them pause. Perhaps it would take another Trump victory in 2020 to bring that about. The always foolhardy and impetuous mob is cowardly and susceptible to rumor. All id and no superego, it's obsessive, frantic, arrogant, swarming, intellectually rigid, notorious, coercive, and bullying. The mob, at its most extreme, lynches innocent blacks in the Old South and murders a student in Pakistan over false rumors that he’d shared blasphemous content on social media. In the form it takes in current left-wing politics, the mob makes every person on Twitter a potential public figure and seizes any opportunity to perform the high-tech lynching it gave to Justine Sacco when she tweeted a poorly-crafted “joke” about AIDS in South Africa that was misinterpreted as a racist comment by a privileged person. In fact, Sacco was trying to make a comment critical of the privileged, but after the social media mob swarms and slimes you, you get fired and can't find another job—you can't even date again. Sacco can attest to that. You might even have a heart attack, as the previously healthy ESPN tennis announcer Doug Adler did after an ignorant and vindictive Twitter mob, stoked by New York Times tennis writer Ben Rothenberg, attacked him on the false assumption that he'd said something racist about Venus Williams, which prompted cowardly ESPN execs to fire him. Not one member of that horde, including Rothenberg, whose job requires that he do so, even bothered to ask Adler what he'd meant, which had nothing to do with race. Mobs don't ask those kinds of questions. Overconfidence in one’s mental capacity is a self-destructive tendency that's fed by the mob, stunts intellectual growth, and leads to laziness of thought and the inability to understand any of the merits in counter-arguments. It limits the ability to learn new things. Politics is a form of warfare. In warfare, the ability to understand the enemy is essential to victory. The mob mentality is what prompts The Guardian to write an article on the Sacco incident that calls her ignorant and quotes her former employer, IAC, characterizing her tweet as “hateful,” without providing any information about how her intent was misconstrued. That article is still up on the Internet, uncorrected. According to the Left's mob rules, she's not entitled to the benefit of the doubt or even a chance to reply. IAC, the communications firm that fired Sacco in 2013, now recognizes it overreacted at the time and has rehired her. ESPN, which knows that Doug Adler is completely innocent of any wrongdoing, hasn't rehired him. Instead, they'll meet him next in a California courtroom later this year with nothing to present but their own lies. The headline of Berlatsky's essay is “Why You Shouldn’t Think for Yourself.” The writer, by his own admission, allows his own benevolent mob to do his thinking for him and he's proud of it. You won't see many writers doing that, for obvious reasons. In their myopia, people like Berlatsky and Rosner assure everyone that their mob is the only good one. They’re wrong, because all mobs are poison. Still, you have to give them credit for their honesty. It lets everyone know exactly how to expect things to go if they and their cohorts ever come into power.